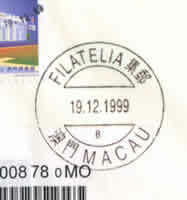 Macau returned to the embrace of motherland on Dec.20,1999. This is a Chinese great happy event. I haven't any friend in the Macau. 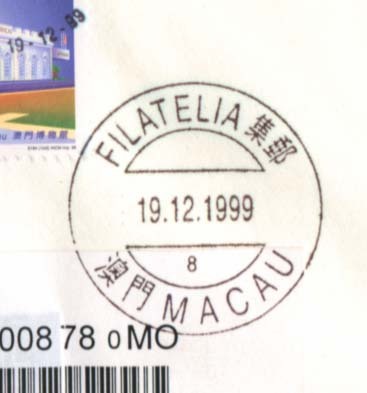 But it is exceeding my expectations that I received 2 registered letters from Macau within 1 week after Macau returned on Dec.20,1999. I took a tumble after I carefulness watch, these are 2 special unable getting again entire covers that is sent by my German philatelic friend Mr.Chi entrusted his Macau friend. 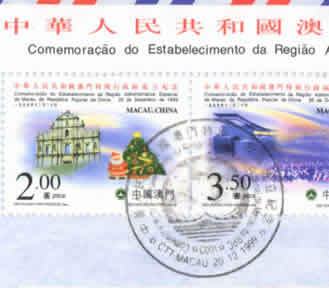 one is a Macau's "Last day cover" stuck the " Macau review" stamps issued by Macau post that is in Portugal jurisdiction on Dec.19,1999; other one is a Macau's " First day cover " stuck the " The established Commemoration of Macau especially administrative region" stamps issued by Macau post that is in P.R.China jurisdiction on Dec.20,1999 (See below). Oh! Transferring of government, Smooth and steady transition, Changing heaven and sun, passing of hours of the night! I am not only one very happy for these rare cover, but it is making me to sigh with emotion that a ordinary German old man such pays attention to distant Chinese affair and such understands a heart emotion in this moment and this place of a ordinary Chinese and philatelist and their culture demand from this reason. Dear friend, I will forever treasure up your deep feeling and kindness. New mobile web site “Philatelic collection transfer"